Taste test: This cereal bar was on the sweet side, with a fairly high density for a cereal bar. 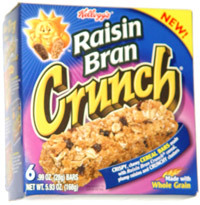 It didn't really taste much like raisin bran, and it tasted just a little bit like raisins. It left a sugary aftertaste in the back of the throat, which would not go away until I had a glass of milk. The bar was really nothing great, but I suppose it would make a marginally OK breakfast if you were in a pinch and had nothing else to eat. But I would recommend avoiding this bar unless you can alternate bites of it with sips of milk. Smell test: Very sweet cereal smell.